Even being over 50 years ago, the table plays great. Being so long, it’s very difficult to get pucks to stop at the end of the table. You could probably practice on it for years without becoming a master. The pucks appear to be the original pucks for the most part, although a couple of them appear to be replacements (probably from when it was on location). The pucks were a dark blue and a bright red, if anyone is curious about that. The table itself is in fantastic condition for as old as it is, it’s hard to imagine one being in better shape than this one. Most of the wear on the table is around the bottom of the leg area, where people were probably rubbing against it all these years. There’s also wear on the ends of the table obviously where people have been playing. The one question is, does anyone know what the original scoreboard and lights looked like on this table? And are originals anywhere? I think the owners would like to purchase them if they knew what to look for. It’s a little hard to figure out exactly what they need to buy, the information on this table is pretty lacking on the web currently unfortunately. 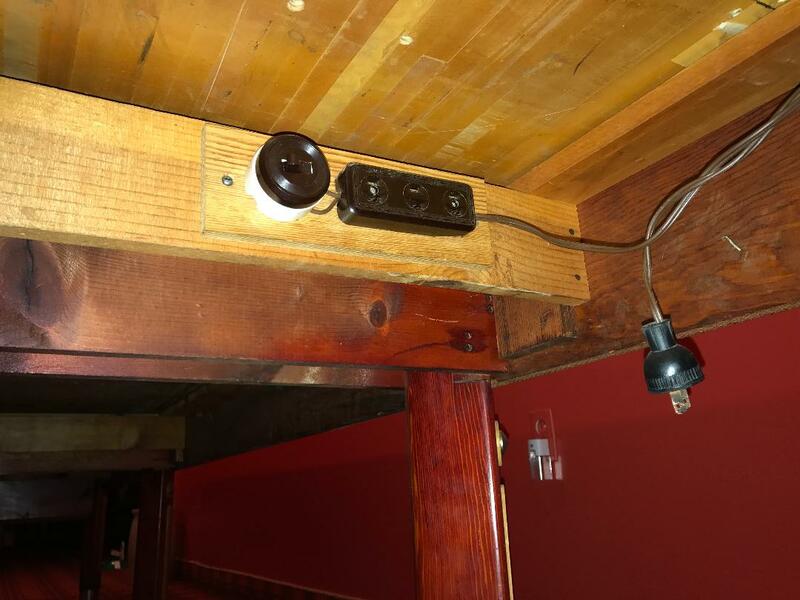 American Shuffleboard Company table parts appear to be hard to find. Most of the pictures I was able to find were of the digital version and not of the Electro-Mechanical version (which were the versions before the late 70’s). Hopefully that helps out people looking for that information. I just purchased a table like yours pictured. I do have a working scoreboard. I am trying to find what I can expect to pay to have the complete table, (carriage and playing surface) refurbished to the original. To refinish the entire table would probably cost thousands because the item is so large and would require someone who really knows what they’re doing with antique furniture. Probably more than the item is worth. If you’ve got the working scoreboard, could you send me a picture of it? I don’t know exactly what it’s supposed to look like. In order to restore it, you’d have to get a quote from a local furniture restorer. Depending on the condition, it’s probably going to cost quite a bit just because of the size…basically, if you restore it, do it because you want it, not because you’ll make money on it. Selling it isn’t too hard on craigslist or facebook marketplace, lots of people looking for shuffleboards. Hardest part with a 22ft one is finding someone who can actually fit it in their house. I have one that I’d like to sell,any idea what they’re worth? Depending on your location and condition, probably anywhere from $500 to $5000. Bad condition table out in the middle of nowhere? $500. Top notch condition in a major city? Might be able to get $5000. Ebay auctions show that people are getting between $1k and $4k for them in the past few months. 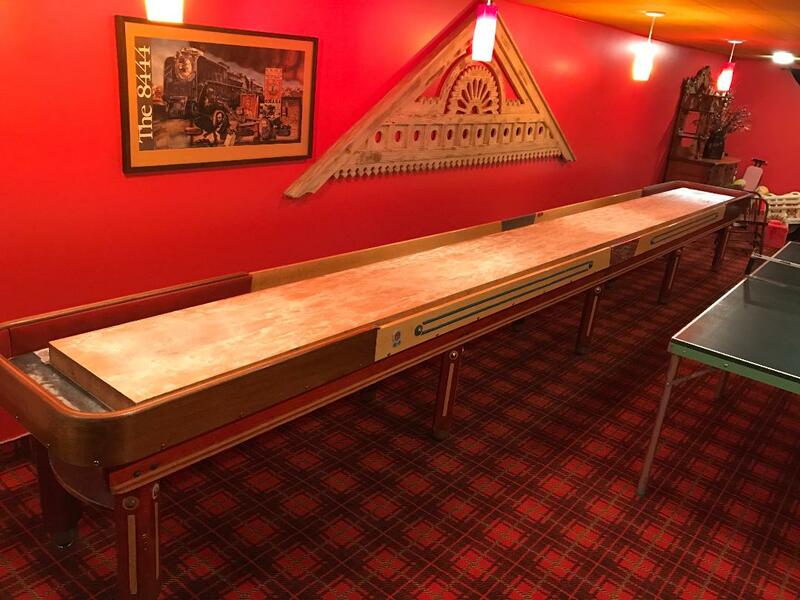 I have a “short board” 12′ long table from the 1950’s with the coin operated scoreboard. This model requires 1 rebound off of the bumpers to add the challenge of a longer table. Here are Photos of the scoreboard the you might have had on yours. We just came into ownership of a 22ft. Board that looks like yours in the picture it is American suffleboard company. It has the coin machine attached to the side . It has a score board with it. It also was in a basement for approx. 50 years. Unfortunately we do not have a location large enough to keep it so we will have to look to sell it and came across your site. Are you still looking for the scoreboard? 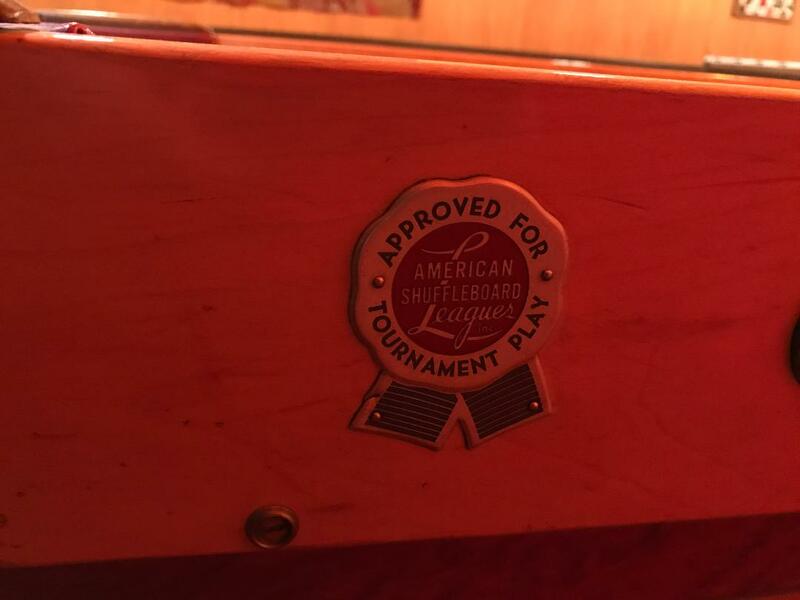 I have an American Shuffleboard in my cellar, and have had it since 1979. It had the original scoreboard as well…and it works. It’s from the 1950’s. I have a 22 ft American Shuffleboard Company-Imperial that I completely restored. Resurfacing the board was the challenging part. The cradle was easy with normal sanding, pain/stain, etc. There used to be services that would pick up the top and resurface in their shop. None remain in the Midwest anyway. I built a fixture to use with a Router to completely plane the surface. Then sanded and finished. Link to see the process and result is attached.